Are you confused by all the back and forth on health care reform? Here’s a guide to some of the terms commonly tossed about in the debate. Blue Dog coalition: The Blue Dog coalition is a group of 52 fiscally conservative Democrats in the House. The Blue Dogs insist that health care reform should preserve patient choice and maintain competition in the marketplace without adding to the national deficit. They’ll play a critical role in getting a bill through the House. Co-op: Nonprofit health cooperatives, or “co-ops,” are being proposed as an option to compete with the private sector and as an alternative to a government-sponsored public health insurance option. Co-ops are owned and governed by the same people they insure. Electronic records: President Obama wants to computerize all records within five years as a way to increase quality of health care and decrease costs. Under his plan to modernize health care, all health records would be standardized and electronic. End-of-life counseling: The current version of the House bill contains a provision for end-of-life counseling for Medicare beneficiaries who want it. The House bill allows for coverage of such appointments as long as an individual has not had an end-of-life care or advance care planning consultation within the last five years. The idea has been a sticking point in the health care debate, as critics have likened it to a step toward euthanasia and “death panels.” Gang of Six: The Gang of Six is a group of members of the Senate Finance Committee who are trying to craft bipartisan health care legislation. The gang is made up of Democrats Max Baucus of Montana, Jeff Bingaman of New Mexico and Kent Conrad of North Dakota. The Republicans are Michael Enzi of Wyoming, Charles Grassley of Iowa and Olympia Snowe of Maine. Health insurance exchange: Obama says any health care bill he signs must have a health insurance exchange, which he defines as a “one-stop shopping marketplace where you can compare the benefits, cost and track records of a variety of plans — including a public option to increase competition and keep insurance companies honest — and choose what’s best for your family.” The term refers to the marketplace of the health insurance options. Health care rescission: Health care rescission is the process by which insurers cancel coverage, often after finding that a person omitted pertinent information on his or her application. Some companies have been accused of improperly rescinding policies as a way to avoid paying for expensive treatments. House Energy and Commerce Committee: The House Energy and Commerce Committee is key panel that passed a health care reform bill just before the August recess. The bill, House Resolution 3200, has not been taken up by the full chamber. Rep. Henry Waxman, D-California, chairs the committee. Mandated coverage: Some lawmakers have proposed mandated coverage, which would require all Americans to get a minimum amount of insurance. The mandate could be enforced with a tax penalty. Medicare/Medicaid: Medicare and Medicaid are public health options. Medicare is a government-sponsored program for people 65 years or older. Medicaid is a health care program for low income individuals and families. “Obamacare”: A term used, often derogatorily, to describe Obama’s health care proposals. Private insurance: Private insurance is coverage offered by a company other than the government. 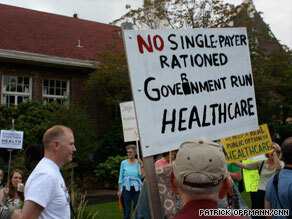 Public option: A public option is a government-funded, government-run health care option, similar to Medicare. Under the plan, people would pay premiums 10 to 20 percent less than private insurance. Some Democrats have said it will be impossible to pass a bill without a public option, but some Republicans have called the idea a deal-breaker. “Rationing” care: Critics of Obama’s health care proposals claim that his plan will lead to a rationing of care, by which care would be distributed according to need. Obama insists that his plan will expand access, not decrease it. Senate HELP committee: The Senate Committee on Health, Education, Labor and Pensions drafted the one health care reform plan that has been introduced in the Senate. Single-payer: Under a single-payer system, the financing system relies on one “payer” — which could be a government-run agency — to fund all health care costs billed by doctors, hospitals and other health professionals. “Socialized” health care: Critics charge that Obama’s health care proposals will lead to a government takeover of health care. They fear that private insurers would be driven out by a public option, leading to health care system entirely run by the government.